Microsoft recently unveiled its first retail store on the East coast at the Tysons Corner mall in McLean, Virginia. Like other Microsoft stores, the new location is strategically placed near the local Apple Store. 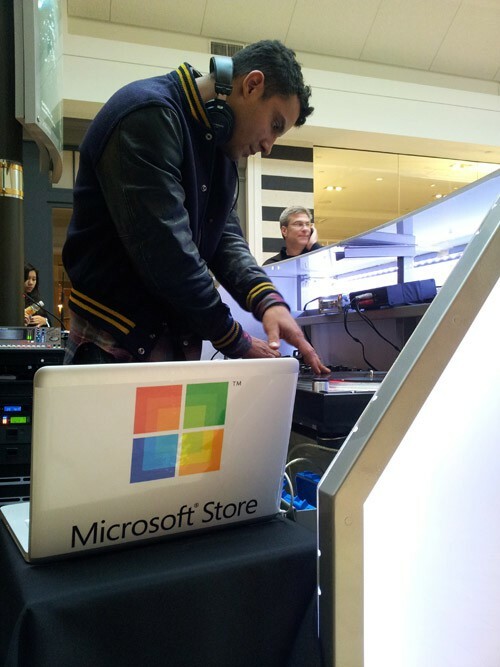 In an attempt to appeal to the hip and cool computer geeks out there, Microsoft hired a DJ to play music during the store’s opening. Can you guess what kind of laptop the DJ used? Not only was the DJ clearly using a MacBook Pro, but Microsoft made him cover the Apple logo with a “Microsoft Store” sticker. If you can’t beat ’em, cover ’em up with your own branding. According to Electronista, Microsoft saw an eight-hour line for its store opening, but people weren’t lined up because they wanted to get their hands on the latest Windows Phone. Microsoft was giving away free tickets for a sponsored Joe Jonas concert taking place the following weekend. To get a ticket, you had to stand in line during opening day.